Good Tuesday morning to all of you! Hope you all are getting ready for work and we know you all will have a wonderful day. Working can sometimes be really hard, and sometimes people can feel like they are hanging off the side of a cliff by just the tips of their fingers. 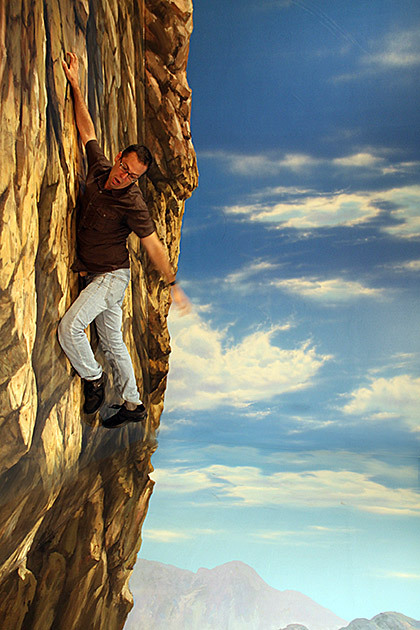 Now, today’s optical illusion is all about a man hanging from the side of a cliff. Just take a look at this poor man, and it really does look like he is in a heap of trouble doesn’t it? Believe it or not, this heart stopping image is actually not real, but an optical illusion. You all will be relieved to know that this poor man is not moments away from falling to his own death, which we are all very thankful for. Want to see another really cool optical illusion that was actually a movie poster? Check out this poster for The Dinosaur Project. This poster may look ordinary, but it really has a hidden image of a dinosaur! Do you all see it? If you need a hint, all you have to do is look at the branch that the people in the poster are walking on, which forms the dinosaur’s mouth. See it now? We hope you all have a great Tuesday, and we will speak again tomorrow.